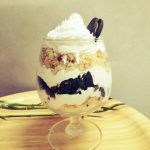 Oreo Vanilla Parfait – Looking for an easy dessert recipe? Then have a look at this recipe – A dessert made from cake, oreos, and whipped cream! 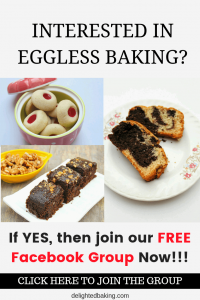 Do you love eating desserts? Do you love trying out new dessert recipes? If YES, then dessert is a must try. Firstly, because it is soooo easy to make. All you need is to collect all your ingredients and stack them up in a glass. Yes! It’s that easy. Also, because it is a fusion dessert. In one bite, you will get so many flavors. It’s a beautiful blend of oreos, cake, dry fruits, choco chips, whipped cream etc. This is a perfect party dessert. Not only the kids but even the grown ups are gonna love this dessert. The ingredients of this recipe are some of the most easily available ingredients. For this recipe you will need vanilla cake. We will crumble the vanilla cake into a fine powder. This fine powder will make the layers of the oreo vanilla parfait. For crumbling the vanilla cake, you can either add the vanilla cake pieces into a food processor and blend them so that the cake pieces get crumbled into a powder or you can simply crumble the cake pieces into a fine powder with the help of your hand. As the name suggests another important ingredient of this recipe is oreo. We will break the oreo biscuits into very small pieces. For combining the various layers of this oreo vanilla parfait, we will use whipped cream. You can either use non diary whipped cream or simple heavy cream. We will whip the cream till it forms soft peaks. You can either add the whipped cream using a spoon or wit the help of a piping bag. I find the later one easier to use. There are some add-ons in this recipe. These add-ons will further enhance the taste of our oreo vanilla parfait. I have added some chocolate chips, tutty frutti and some chopped almonds. Other add-ons that can go well with this oreo vanilla parfait recipe are chopped cashews, chopped pistachios, caramel chips, etc. As you can see this recipe uses some of the most loved ingredients. You would definitely love eating this oreo vanilla parfait. Oreo Vanilla Parfait - Looking for an easy dessert recipe? Then have a look at this recipe - A dessert made from cake, oreos, and whipped cream! In a bowl, add the cake pieces (you can either use ready made cake or homemade cake.). Crumble these or break these cake pieces into a fine powder. In a separate bowl, take cream and whip it. For convenience, I'll suggest you to fill a piping cone with whipped cream. If you don't have a piping cone, then you can simply use a spoon for adding whipped cream. Take a glass. Put a small amount of cream in the glass. Top this with powdered cake pieces. Press this with your hand. Now add some chocolate chips on top. Again add some whipped cream. Now break the oreo biscuits into small pieces and add on the top. Again add some whipped cream. Add some tutti fruti. Top this with powdered cake pieces. Press a little with the help of your hand. Add chopped almonds/cashews. Again add some whipped cream and add some oreo biscuits. Add chocolate chips. Like this continue till you fill the whole glass with alternate layers of cake, oreo and whipped cream. In the end, you can either decorate it with whipped cream (as shown in the photo) or you can simply top this with chocolate chips. Keep this in fridge for at least an hour or two. Your yummy vanilla oreo parfait is ready! Like this recipe? Why not PIN IT and share it with others?